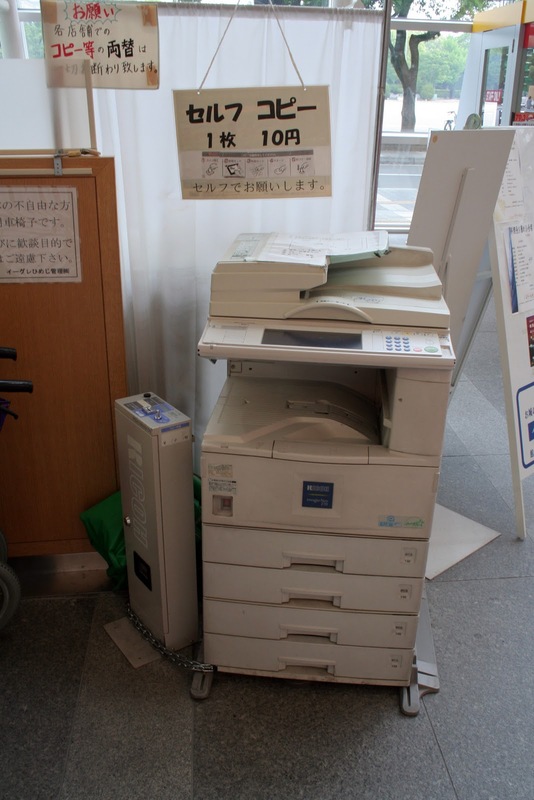 I love the all-in-one copiers in Japanese convenience stores. It's great to have access to a copier any time of the day or night for those of us who are bastions of non-procrastination and deadline management. But not only that, I love these all-in-one copiers because of all the other amazing things they do for me. If you ever need to send a fax on the go (or at home, because who buys a personal fax machine anymore? ), convenience stores are your best friend. Just pop in the coins, dial the phone number, and run the document through. Easy stuff. Convenience store printers are all generally equipped with flash card and USB readers to print off digital pictures. But, they also offer the reverse service. You can place documents into the machine and have them scanned back into digital images (PDF, JPG, TIFF, and more) which are saved onto the USB memory stick you plug in. It's not cheap to scan like this (around 50 yen per scan! ), but if you need something digitized in a hurry, this is a great option to have. This is my second-favorite feature on a 7-11 printer, and one that I haven't yet found in other convenience store chains. Not only is it possible to print off digital photos at these printers, but you can print off documents too. Just save it to your SD card, USB reader, etc. and print away. It's as cheap as copying: 10 yen per page in greyscale. 7-11 handles PDF, XPS, and XDW files. The only tricky thing here is that you can't play around with page size. The printers seem to only want to print PDFs that are of A4 size (or near A4 size, like 8 1/2" x 11") pages. I saved a B5-sized document and took it to one of these machines once, only to find I had to drive back home and do it over again. This is my favorite feature, hands down. In fact, it is so good, it needs a separate article. It does everything that document printing can (as explained above), plus more, and the only reason I list document printing separately is because Net Print costs a little more. But yeah, if you haven't heard of or made use of Net Print, you need to check it out.